Player Y is one of the game’s least productive right fielders. Yet, he is not the only below-average hitter in his team’s outfield, which ranks last in the majors in batting average and near the bottom in on-base and slugging percentage, too. Would it make sense for Player Y’s team to look for a better hitter at his position and more proficient outfielders in general? Of course it would. Which is why Player Y’s team, at the very least, is open to trading him, according to major-league sources. 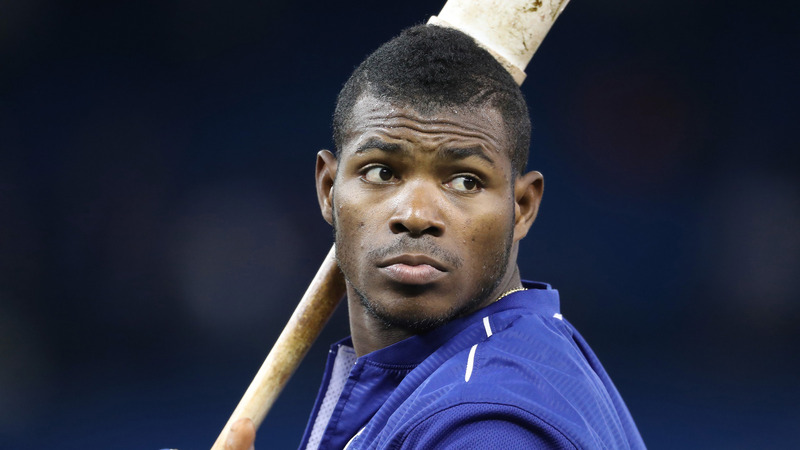 Player Y, if you haven’t figured it out, is the Dodgers’ Yasiel Puig. His defense this season is above-average. His personality seemingly is less of an issue than in the past. 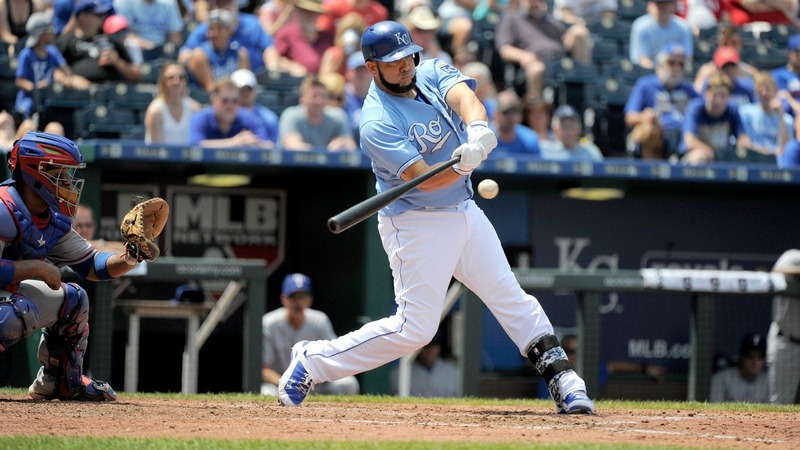 He even is hitting better since coming off the disabled list, producing an .831 OPS in 89 plate appearances. 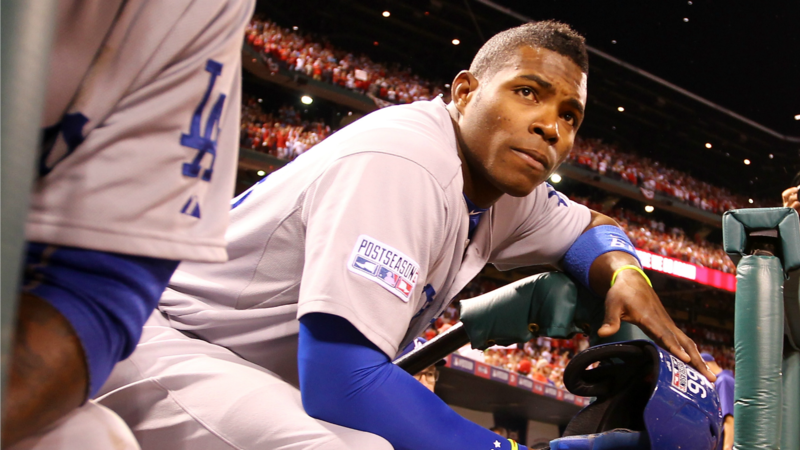 But for the season, Puig still has only a .700 OPS, still only seven home runs. 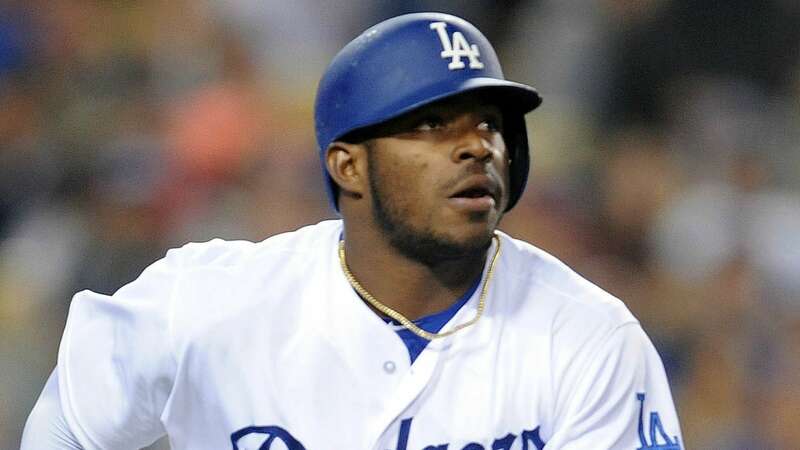 Perhaps the Dodgers will keep Puig, buying into his latest surge and banking on the fact that he is only 25. Or perhaps they finally are at wit’s end with his performance if not his personality, and will try to sell relatively high, assuming Puig does not regress in the next two weeks. The answer soon will be clear. The merry go-round in the Dodgers’ outfield is nearly as pronounced as the one in their rotation — they have started six left fielders, six right fielders and five center fielders. Trayce Thompson hit the DL on Saturday with lower back irritation. Joc Pederson is expected to be activated Tuesday after missing time with a sprained right AC joint. Andre Ethier is out until at least mid-August with a fractured right tibia. Of the outfielders known to be available in trade, the Reds’ Jay Bruce or Athletics’ Josh Reddick appear the most logical fits, unless the Dodgers are willing to hold their noses and acquire the Brewers’ Ryan Braun — which, according to a source, is not happening. Bruce’s defensive metrics are alarming, but perhaps not entirely trustworthy — his ranks among right fielders in defensive runs saved the past four seasons have varied wildly, from third to 29th to 11th to 34th. Reddick, meanwhile, is batting only .208 with a .651 OPS since returning from a fractured left thumb June 28. Maybe the Dodgers are ready to acquire some mysterious Player X. Or maybe they will continue to hold out hope for the mysterious Player Y, Yasiel Puig. Want to know why Royals general manager Dayton Moore still sees his team as a buyer, even with a run differential of negative-22, the sixth-worst in the AL? Consider his team’s 2014 edition, which advanced to Game 7 of the World Series. The Royals that year entered the All-Star break on a 9-14 slide, then lost their first four games after the season resumed, falling to 48-50. The ’16 Royals are proceeding in similar fashion — they entered the break in a 7-12 rut, then lost two of three in Detroit before rallying against the Indians on Monday night to improve to 47-45. Moore, since becoming GM in June 2006, has exhibited great patience with his club. He’s not about to shift course now, not coming off a World Series title. "We want to move forward. That’s kind of how we’re wired," Moore said. "We’re very confident and trusting in this group of players, that they will remain in a pennant race throughout the entire season. We’re going to do everything we can to improve our roster." Moore said that he will meet with manager Ned Yost and ownership closer to the deadline to determine the team’s exact course. In the meantime, he and his assistants are laying the groundwork for deals, evaluating the trading landscape. The Royals, who opened the season with a club-record $131.5 million payroll, according to Cot’s Baseball Contracts, are almost certain to be limited financially, a predicament that again will force them to give up better talent in trades. The Athletics paid the vast majority of Ben Zobrist’s remaining salary when they traded him to the Royals last season, and the Reds did the same with Johnny Cueto. The deals cost the Royals five pitching prospects, four of whom have started games in the majors this season. The current Royals, meanwhile, rank 25th in the majors in rotation ERA. Moore could trade his potential free agents — right-hander Edinson Volquez, designated hitter Kendrys Morales and reliever Luke Hochevar — but he might as well squeeze as much out of this group as he can, with the team’s competitive window narrowing. The question is, how far should Moore go? 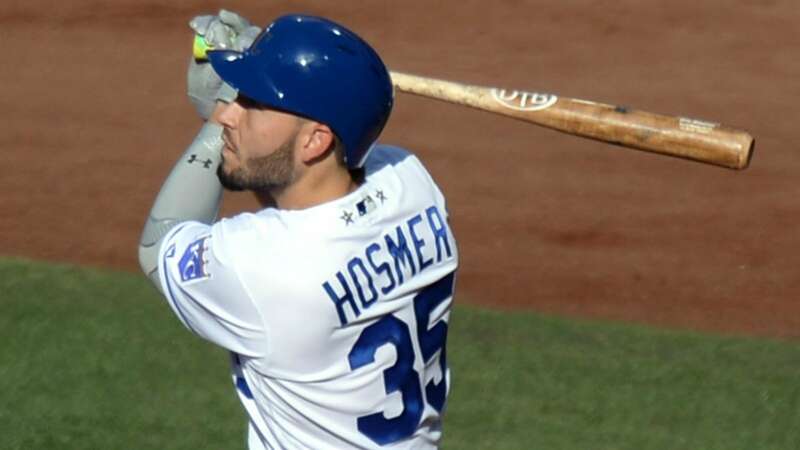 First baseman Eric Hosmer, third baseman Mike Moustakas, shortstop Alcides Escobar and center fielder Lorenzo Cain all are eligible for free agency after next season. It would be difficult for the Royals to trade some of their potential replacements — shortstop Raul A. Mondesi, outfielder Jorge Bonifacio, third baseman Hunter Dozier. But in the end it might be necessary, if Moore truly believes in his team. 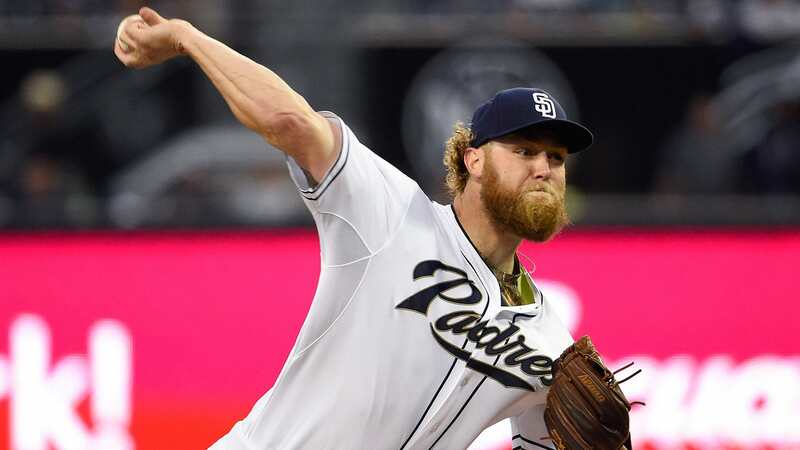 *Never mind that Padres right-hander Andrew Cashner is sporting a 5.05 ERA; the potential free agent is drawing trade interest of a surprising number of clubs, according to major-league sources. The Rangers are one of those clubs, as first reported by MLB.com. Cashner delivered perhaps his best start of the season last Friday night against the Giants, striking out nine and allowing just one run in six innings. 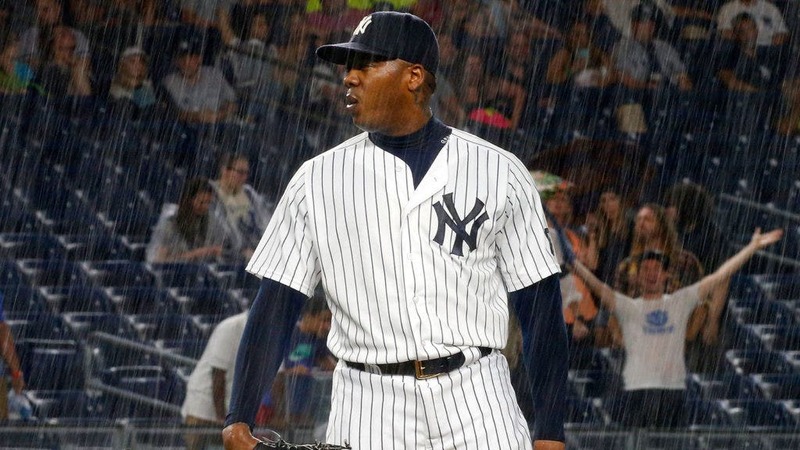 *Yankees closer Aroldis Chapman is the Nationals’ most likely target, sources say — manager Dusty Baker is fond of him from their days together with the Reds, and the acquisition cost for Andrew Miller might be beyond the Nats’ liking. While the Nats might not consider right-hander Lucas Giolito as untouchable as they once did, would they trade him for a reliever, even one as good as Miller who is under control for two more years? Seems doubtful. As for an outfielder, the Nationals still could pursue a Bruce or Reddick, but the team does not want to move Bryce Harper from right to center. Trea Turner in center likely will become more of an option if the Nats do not acquire outside help. *The Indians are not on Bruce, sources say, and they prefer Miller to Chapman in their pursuit of a left-handed reliever. Chapman almost certainly would want to close, while Miller has demonstrated his willingness to set up, making him a better complement for righties Bryan Shaw and Cody Allen. The Indians lack a left-hander in either their rotation or bullpen, and Miller would give manager Terry Francona the ability to counter left-handed hitters at any point late in the game, not just the ninth. *As of a week ago, the Twins attracting the most trade interest were infielder Eduardo Nunez, catcher Kurt Suzuki, left-handed reliever Fernando Abad and right-handed reliever Brandon Kintzler, according to a major-league source. Right-handed starter Ervin Santana, owed a combined $27 million in 2017 and ’18, was not drawing attention from other clubs, the source said. *Per Inside Edge, the White Sox before Monday night had only two line-drive outs over 49 balls put in play in their previous nine games — two! That’s 4.1 percent. *The Athletics’ Marcus Semien has hit 20 homers and the Rays’ Brad Miller 15. In the age of the homer, every shortstop is Cal Freakin’ Ripken.